To Cite: Soleymanzadeh Moghadam S, Khodaii Z, Fathi Zadeh S, Ghooshchian M, Fagheei Aghmiyuni Z, et al. Synergistic or Antagonistic Effects of Probiotics and Antibiotics- Alone or in Combination- on Antimicrobial-Resistant Pseudomonas aeruginosa Isolated from Burn Wounds, Arch Clin Infect Dis. 2018 ; 13(3):e63121. doi: 10.5812/archcid.63121. Background: Bacterial burn infections are one of the serious infections and since their treatment with antibiotics is very difficult, infection control in such wounds is very important. Therefore, methods should be sought to enhance the effects of antibiotics and also reduce the resistance to them. It seems that probiotics have antimicrobial features and are effective in wound healing. Objectives: The current study aimed at evaluating and comparing the antimicrobial effects of antibiotics and probiotics, as well as their combination on bacterial burn infections. Methods: Thirty clinically resistant Pseudomonas aeruginosa species isolated from hospitalized patients with burn wounds were collected. Antibacterial activity of five antibiotics and 11 probiotic strains, and also their combination were evaluated by disk diffusion method. One-way ANOVA and Tukey post hoc test were used for data analysis. Results: It was found that the effect of inhibitory zone in combination use of tetracycline + a probiotic strain was more than using the antibiotic and probiotic alone. Also, the current study found that among the probiotics, Lactobacillus plantarum 299v had the highest effect, although not significant, on resistant P. aeruginosa. The current study explained that the inhibitory effect of L. plantarum 299v was significantly higher than that of ciprofloxacin (P = 0.009). In addition, antibacterial activity of gentamicin + L. salivarius (ES1) was significantly higher compared with that of gentamicin + L. routeri (P = 0.01). Conclusions: The current study explained that probiotics had a useful potential inhibitory effect on the growth of the pathogens. The study showed that in most cases, inhibitory zones of probiotics were greater than those of antibiotics as well as combination of antibiotic + probiotic. But, there was an exception in tetracycline, which had synergistic effect with probiotics. Conversely, in the cases of imipenem and chloramphenicol, addition of probiotics had antagonistic effects. Further studies are needed to describe different results. Therefore, it seems that the type of antibiotics and probiotics are important to create the synergistic or antagonistic effects. Pseudomonas aeruginosa is a Gram-negative, opportunistic human pathogen (1). The use of therapeutic solutions to control or reduce resistance in P. aeruginosa is one of the important cases recently raised attentions, especially in burn injuries (2). Also, the prevalence of resistant pathogens creates problems to treat the infection in patients. In fact, this problem created major concerns in the medical societies (1, 3). Patients with burn injuries are at high risk for nosocomial infections. Hence, the control of antibiotic resistance can be one of the main strategies to prevent multidrug-resistance (MDR) infections (4). In recent years, the role of probiotics is confirmed to control burn infections. These materials produce vitamin B, lactic acid, hydrogen peroxide, and acetic acid that play the important role in the inhibition of the growth of pathogenic bacteria (1, 5). In other words, probiotic strains are the best alternative treatment for the infectious diseases (6). In this regard, a number of studies show the inhibitory effect of Lactobacillus strains on the growth of the resistant strains of Pseudomonas aeruginosa (7-9). Some studies reported that extracellular products of lactic acid bacteria and Bifidobacterium species can inhibit the growth of pathogenic microorganisms and they contribute to burn wounds healing (10). The consumption of antibiotics commonly used to treat the infectious diseases can reduce the protection of beneficial bacteria in gastrointestinal tract, leading to several diseases (11). Thus, application of probiotics can restore the normal intestinal flora and inhibit the growth of harmful bacteria. Also, a combination of antibiotics and probiotics may compensate and minimized the complications caused by the antibiotics (2). The current study aimed at evaluating the antimicrobial effects of antibiotics including imipenem, ciprofloxacin, chloramphenicol, gentamicin and tetracycline, and those of some probiotics including L. salivarius, L. reuteri, L. acidophilus, Bacillus coagulans, L. plantarum, and Bifidobacterium bifidum, as well as their combinations (probiotics + antibiotics) against MDR P. aeruginosa isolated from burn wounds. The current study was conducted from November 2015 to December 2016. Thirty MDR isolates of P. aeruginosa were clinically isolated from patients with burn wounds within 10 - 15 days. The patients were selected from Tehran Motahari hospital affiliated to Iran University of Medical Sciences. The isolates were transferred to the microbiology laboratory of antimicrobial resistance research center to approve the identification of P. aeruginosa. Samples were cultured on MacConkey agar, incubated under aerobic conditions for 24 - 36 hours at 37°C (3). The isolated bacteria were identified based on colony morphology, microscopic Gram stain investigation, and standard biochemical tests (3). The sensitivity of samples was determined by disk diffusion method using Mueller-Hinton agar according to the clinical and laboratory standards institute (CLSI, 2016) recommendations. In the current study, the following five antibiotic disks (Mast Group Ltd., Merseyside, UK) were used: imipenem (10 μg), gentamicin (10 μg), chloramphenicol (30 μg), ciprofloxacin (30 μg), and tetracycline (30 μg). In the current study, the reference strain P. aeruginosa ATCC 27853 was used for quality control (12). For this purpose, the bacterial suspension (0.5 McFarland) were cultured on Mueller-Hinton agar plates and then antibiotic discs were placed on the medium and incubated at 37°C for 16 hours (1). Among the thirty MDR strains of P. aeruginosa, four isolates that showed the highest antimicrobial resistance were selected. Highest resistance (small inhibitory zone) was examined based on the zone diameters. In the current study, 11 probiotic strains were taken from probiotic research center of Alborz University of Medical Sciences, five commercial probiotic strains were purchased from DSM and six local Lactobacillus strains were isolated from broiler feces of tropical area of Iran by agricultural biotechnology research institute of iran (ABRII) and identified based on biochemical tests and 16s RNA as described previously (3). 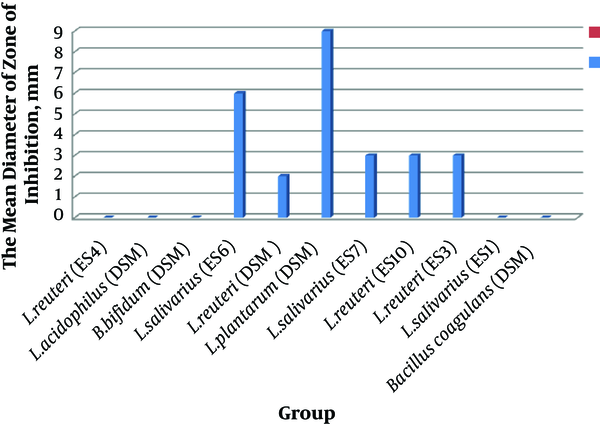 The commercial probiotic strains included L. Reuteri (DSM17938), L. acidophilus (DSM), B. coagulans (DSM1), L. plantarum 299v (DSM9843), and B. bifidum (DSM20456). The local Lactobacillus strains included L. reuteri and L. salivarius. Probiotics were cultured in MRS broth, a selective medium for profuse growth of lactic acid bacteria, and incubated under anaerobic conditions at 37°C for 48 - 72 hours (13). Then, they were transferred to MRS agar (Merck, Darmstadt, Germany). Finally, probiotics were aseptically frozen at -4°C for two weeks. Antibacterial activity of all the 11 probiotic strains was tested separately against four isolates of P. aeruginosa. Antimicrobial resistant samples were examined using previously probiotic-coated discs. Probiotic-coated discs obtained using the below-mentioned protocol. probiotics were cultured on MRS broth (0.5 McFarland standards), then 20 γ (mL) of probiotic suspension was added to the blank disc and placed on a Muller-Hinton agar medium and incubated at 37°C for 16 hours (1, 7). In the above sections, the antibacterial activity of antibiotic disks and the mentioned probiotic strains were separately investigated. In this section, the antibacterial activity of antibiotic and probiotic strains was tested separately. In the combination method, four P. aeruginosa isolates were cultured separately on Muller-Hinton agar plates. Twenty milliliters of each 11 probiotic suspensions were added to the five antibiotics discs separately. Then, the plates were incubated at 37°C for 16 hours. The inhibitory zone diameters were measured and recorded. The SPSS version 20 as well as Excel 2010 was employed for statistical analysis using One-way ANOVA and Tukey post hoc test. In the current study, the effects of 11 probiotic strains were measured against resistant pathogenic isolates. The antimicrobial activity of these probiotic strains against P. aeruginosa isolates were shown as mean diameter of inhibitory zones. As shown in Figure 1 among the probiotic strains, L. plantarum 299v had the highest mean inhibitory diameter against MDR strains of P. aeruginosa. Among the MDR isolates of P. aeruginosa, those sensitive to eight probiotic strains were selected (Figure 1). Antibacterial activities of the mentioned probiotics and antibiotics alone and in-combination forms against P. aeruginosa were examined by measurement of their inhibitory zones. The results are illustrated in Figure 2. Figure 2. The antibacterial activity of probiotics and antibiotics alone and in-combination against P. aeruginosa isolates based on the inhibitory zones diameter. Tetracycline (TET), imipenem (IM), ciprofloxacin (CIP), chloramphenicol (CL), gentamicin, probiotic (P). The current study found that antibacterial activity of probiotic strains was more than that of antibiotics. The antibacterial activity was examined by measurement inhibition zones (Figure 2). The current study showed that the mean diameter of inhibitory zones in the combination form of tetracycline + probiotics was higher than that of tetracycline or probiotics alone, although the difference was statistically insignificant. And also in most cases, the antibacterial activities of probiotics were more than those of antibiotics alone. 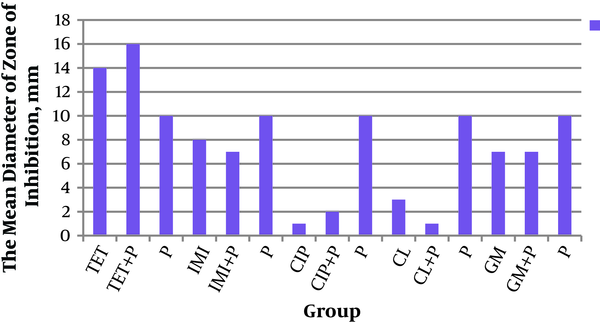 Antibacterial activities of probiotics were more than those of antibiotics alone and the combination form, especially ciprofloxacin (Figure 2). Among these findings, the effect of L. plantarum 299v was significantly higher than that of ciprofloxacin (P = 0.009). In addition, antibacterial activity of gentamicin + L. salivarius (ES1) was significantly higher than that of gentamicin + L. routeri (P = 0.01). The current study aimed at evaluating the antimicrobial activity of selected antibiotics and probiotics as well as their combinations against MDR P. aeruginosa isolated from burn wounds. The current study showed that the mean diameter of the inhibitory zone of probiotics was greater than that of antibiotics. The same result was reported from a similar study on P. aeruginosa conducted by Chauhan who showed that in about 72% of the cases, inhibitory zones of probiotics were greater than those of antibiotics (5). There are several mechanisms to justify the protective and therapeutic effects of probiotics including production of antimicrobial agents, pathogen elimination, and immunomodulation (2, 14, 15). Also, it was reported that in half of the cases, the efficacy of a combination from of probiotics plus antibiotics was higher than that of antibiotics alone (2). In the current study, the effects of probiotics alone in most cases -except in combination with the tetracycline- were better than those of the probiotic +antibiotic and antibiotic alone (Figure 2). Therefore, laboratory results of the current study showed that Lactobacillus strains increased the inhibitory zone of P. aeruginosa, compared with those of antibiotics, except tetracycline. Probiotic strains -including L. salivarius, L. reuteri, L. acidophilus, B. coagulans, L. plantarum, and B. bifidum- alone or in combination with pathogens had considerable effects (16). Findings related to tetracycline were totally different from those of other antibiotics. In fact, among the five antibiotics employed in the current study, tetracycline had synergistic effect with probiotics. In other similar studies, synergistic effect was observed in the combination of doxycycline and probiotics (7, 17). Also, in a study on urinary tract and nosocomial infections, it was observed that the diameter of the growth inhibition zone of P. aeruginosa in combination with probiotics and aztreonam was higher than those of ciprofloxacin, meropenem, and amikacin separately. Actually, it was determined that there was synergistic effect between aztreonam and probiotics (2, 17). Therefore, it seems that the type of antibiotic and probiotic is important in creating the synergistic or antagonistic effects. In this regard, the differences in the mechanism of action of antibiotics are important. For example, doxycycline by binding to the bacterial ribosome subunit 30s inhibits the protein synthesis. Therefore, when antibiotic is used separately, the pathogen tolerates in the situation better than the combination forms of antibiotics plus probiotics. Probiotics increase the penetration rate and provide higher sensitivity (3). Therefore, probiotic strains can be used to support the potency of antibiotics against bacterial pathogens (7). In the current study, for the first time, it was reported that tetracycline had higher effects both in combination and alone on MDR P. aeruginosa isolated from burn wounds. For example, it was observed that antibacterial activity of L. plantarum was significantly higher than that of ciprofloxacin (P = 0.009), which was confirmed in similar studies reporting that the combination of L. acidophilus and ciprofloxacin had better effects than antibiotics alone (5, 18, 19). In addition, it was found that the mean diameter of growth inhibition zone of the pathogen using a combination of gentamicin + L. salivarius (ES 1) was significantly higher than that of the combination of gentamicin + L. routeri (P = 0.01), indicating the advantage of combination of gentamicin + L. salivarius compared with gentamicin + L. routeri (5). In the case of antagonistic effects of probiotics on antibiotics, the current study observed that addition of probiotics to imipenem and chloramphenicol had negative effects and reduced the inhibitory zones. However, these results were obtained from in vitro studies, and further in vivo studies are suggested regarding different strains of probiotics and antibiotics in infections caused by MDR pathogens. The current study granted by antimicrobial resistance research centre, Iran University of Medical Sciences, Tehran, Iran. The information provided in the current study was derived from a research project (code: 93-01-13-24557). Authors’ Contribution: Tahereh Mousavi Shabestari and Somayeh Soleymanzadeh Moghadam: All steps of the study; Sara Fathi Zadeh, Maryam Ghoshchiyan, and Zeinab fagheei: Performing experims; Zohreh Khodaii: Contribution to studies of probiotics. Funding/Support: The current study was financially supported by Iran University of Medical Sciences, Tehran, Iran. 1. Shafighi M, Emami Z, Shahsanaei M, Khaliliyan E. Antibacterial Activity of Lactic Acid Bacteria Isolated from Table Olives against Skin Pathogens. World Acad Sci, Eng and Tech, Int J Biol, Biomolecul, Agric, Food and Biotech Eng. 2012;6(1):21-4. 2. Sharma J, Chauhan D. Inhibition of Pseudomonas aeruginosa by antibiotics and probiotics combinations-In vitro study. Europ J Exp Biol. 2014;4(6):10-4. 3. Jebur MS. Therapeutic efficacy of Lactobacillus acidophilus against bacterial isolates from burn wounds. N Am J Med Sci. 2010;2(12):586-91. doi: 10.4297/najms.2010.2586. [PubMed: 22558572]. [PubMed Central: PMC3338227]. 4. Ahuja RB, Bhattacharya S. Burns in the developing world and burn disasters. BMJ. 2004;329(7463):447-9. doi: 10.1136/bmj.329.7463.447. [PubMed: 15321905]. [PubMed Central: PMC514214]. 5. Dasari S, Shouri RND, Wudayagiri R, Valluru L. Antimicrobial activity of Lactobacillus against microbial flora of cervicovaginal infections. Asian Pac J Trop Disease. 2014;4(1):18-24. doi: 10.1016/s2222-1808(14)60307-8. 6. Arbab Soleimani N, Kermanshahi RK, Yakhchali B, Nejad Sattari T. Antagonistic activity of probiotic lactobacilli against Staphylococcus aureus isolated from bovine mastitis. Afr J Microbiol Res. 2010;4(20):2169-73. 7. Hassan HA, Naher HS. Extracellular Products of Lactobacillus acidophilus as Probiotic against Multi-drugs Resistant Pseudomonas aeruginosa. Med J Babylon. 2011;8(3):435-40. 8. Jamalifar H, Rahimi H, Samadi N, Shahverdi A, Sharifian Z, Hosseini F, et al. Antimicrobial activity of different Lactobacillus species against multi- drug resistant clinical isolates of Pseudomonas aeruginosa. Iran J Microbiol. 2011;3(1):21-5. [PubMed: 22347578]. [PubMed Central: PMC3279796]. 9. Dimitonova SP, Danova ST, Serkedjieva JP, Bakalov BV. Antimicrobial activity and protective properties of vaginal lactobacilli from healthy Bulgarian women. Anaerobe. 2007;13(5-6):178-84. doi: 10.1016/j.anaerobe.2007.08.003. [PubMed: 17910924]. 10. Huseini HF, Rahimzadeh G, Fazeli MR, Mehrazma M, Salehi M. Evaluation of wound healing activities of kefir products. Burns. 2012;38(5):719-23. doi: 10.1016/j.burns.2011.12.005. [PubMed: 22237053]. 11. Bartlett JG. Clinical practice. Antibiotic-associated diarrhea. N Engl J Med. 2002;346(5):334-9. doi: 10.1056/NEJMcp011603. [PubMed: 11821511]. 12. Huband MD, Ito A, Tsuji M, Sader HS, Fedler KA, Flamm RK. Cefiderocol MIC quality control ranges in iron-depleted cation-adjusted Mueller-Hinton broth using a CLSI M23-A4 multi-laboratory study design. Diagn Microbiol Infect Dis. 2017;88(2):198-200. doi: 10.1016/j.diagmicrobio.2017.03.011. [PubMed: 28410852]. 13. Goudarzvand M, Rasouli Koohi S, Khodaii Z, Soleymanzadeh Moghadam S. Probiotics Lactobacillus plantarum and bifidobacterium B94: cognitive function in demyelinated model. Med J Islam Repub Iran. 2016;30:391. [PubMed: 27579282]. [PubMed Central: PMC5004565]. 14. Sheih YH, Chiang BL, Wang LH, Liao CK, Gill HS. Systemic immunity-enhancing effects in healthy subjects following dietary consumption of the lactic acid bacterium Lactobacillus rhamnosus HN001. J Am Coll Nutr. 2001;20(2 Suppl):149-56. [PubMed: 11349938]. 15. Andreeva P, Shterev A, Danova ST. Antimicrobial activity of vaginal lactobacilli against Gardnerella vaginalis and pathogens. Int J Adv Res Biol Sci. 2016;3:200-7. 16. Saggioro A. Probiotics in the treatment of irritable bowel syndrome. J Clin Gastroenterol. 2004;38(6 Suppl):S104-6. [PubMed: 15220671]. 17. Mohseni MJ, Aryan Z, Emamzadeh-Fard S, Paydary K, Mofid V, Joudaki H, et al. Combination of probiotics and antibiotics in the prevention of recurrent urinary tract infection in children. Iran J Pediatr. 2013;23(4):430-8. [PubMed: 24427497]. [PubMed Central: PMC3883373]. 18. Cross ML. Microbes versus microbes: immune signals generated by probiotic lactobacilli and their role in protection against microbial pathogens. FEMS Immunol Med Microbiol. 2002;34(4):245-53. [PubMed: 12443824]. 19. Panda AK, Rao SVR, Raju MVLN, Sharma SR. Dietary Supplementation of Lactobacillus Sporogenes on Performance and Serum Biochemico-Lipid Profile of Broiler Chickens. J Poult Sci. 2006;43(3):235-40. doi: 10.2141/jpsa.43.235.